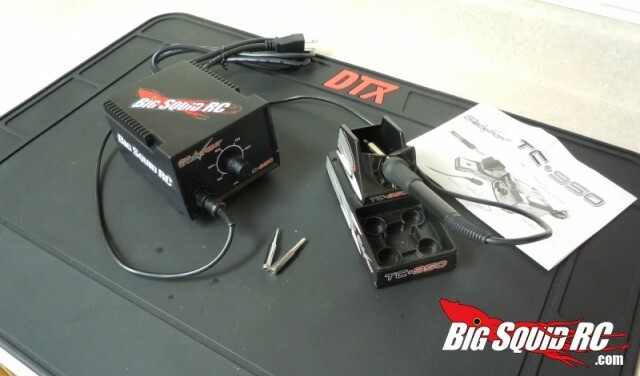 Team Checkpoint TC-950 / Trakpower TK-950 Soldering Station Review « Big Squid RC – RC Car and Truck News, Reviews, Videos, and More! Anyone who has been in the hobby for very long at all recognizes the value of a good soldering iron. It only takes one cold solder joint, one melted wire, or one burnt finger to see that having a good soldering station is just as important as a good battery, motor, or speed controller. When I first got started in RC, I fell victim to the “a soldering iron is a soldering iron” approach. They were cheap, crappy, electronic store irons that in hindsight were just awful. However, when that is all you’ve ever used, that is all you know. A good station isn’t cheap compared to those $15 irons you get at R@dio Sh@ck. However, I didn’t exactly want to go out and spend $300 either. I decided to give the Team Checkpoint TC-950 (also called the Trakpower TK-950, more on that later) a try. Hit the jump to find out how it stacks up versus those cheap alternatives. The Team Checkpoint TC-950 was recently discontinued and replaced with the Trakpower TK-950. A quick glimpse at the specs, as well as a call to Great Planes suggested that these two models are identical in every way, except the decals. In this review, the Team Checkpoint TC-950 was used, and all comments will be based on that model. While I think the exact same things will apply to the Trakpower TK-950, it is worth pointing out. The box contains the soldering iron, a stand, temperature control unit, sponge, both a chisel and pencil tip, instruction manual, and some decals. The iron is rated at 60 watts, and holds the set temperature withing 1.8 degrees F at idle. The temp control unit allows you to select between 392-896 degrees F. The unit has a 5-year warranty and a 1-year warranty on the handle’s electronics. The station runs on standard 110V AC (wall plug), and has a power switch on the side. The overall weight is about 3 lbs. The first thing I noticed with this iron is that it heats up FAST. When the iron is on, a red light indicates the iron is “heating”. Once it reaches the temperature set on the dial, the red light will blink off and on, indicating that it has reached the desired temp and is maintaining it. From room temp to the full 896 degrees F took just 71 seconds! The iron itself has a long cord that runs from it to the temp control unit. The iron felt comfortable in my hand, and changing tips was easy (only do this at room temp only, of course). However, where the cord plugs into the temp control unit is where I must register my first little complaint. It isn’t always easy to tell how the cord needs to be oriented before it can be plugged in. It also didn’t seem to really “click” into place once you plug it in. There have been a couple times I’ve sat dumbfounded at why solder wouldn’t melt just to find out the iron had come unplugged. It wasn’t until later on that I figured out you had to push hard, almost too hard to get the iron to lock into place. UPDATE: We have been informed that all NEW Trakpower stations are shipping with a brand new plug design that eliminates any issues we had with ours. So don’t worry about this if your heading out to buy one! Once I figured out that little trick, the iron heated things quickly, easily, and evenly. I’ve had no issues with cold joints, and the fact that they include both a pencil and chisel tip is a major plus! I couldn’t believe how much better this was than the cheap irons I had been using in the past. The stand is sturdy and makes it pretty difficult to burn yourself or something else as you’re working. The little sleeve that the iron slides into on the stand can be removed to access the bottom of the stand for cleanup. That’s a nice feature as well, however it sits on the stand just a too little sloppy, and sometimes wants to come off with the iron as you’re picking it up. Despite these little gripes, the soldering station as a whole is a great product and an excellent value. Tower Hobbies lists the TK-950 at $79.99, which is a great deal considering what you get. Replacement tips are less than $6.00 a piece should you ever need them. After spending just a few minutes with my TC-950, I knew I’d never be going back to that $15 iron. As always, if you see any of us at the track or a bash spot, stop by and say what’s up! Maybe you can take something for a test drive or at least grab some stickers! Time to Bash – 9.0/10 – Out of the box, plug in, and go! Workability – 8.0/10 – Adjustable temp settings, just make sure you push hard on that pesky plug. Car Show Rating – 8.0/10 – Nothing fancy, even with the decals, but certainly not ugly. Big Squid Rating – 8.0/10 – Tentacles. Great price. Great station. Ditch that cheap-o iron now!